AgroAtlas - Diseases - Bipolaris sorokiniana - Spot blotch of barley. Bipolaris sorokiniana - Spot blotch of barley. Anamorph: Section: Deuteromycotina Class: Hyphomycetes, Family: Dematiaceae, Genus Bipolaris; Teleomorph: Section: Ascomycotina, Class: Loculoascomycetes, Order: Dothidealis, Family: Pleosporaceae, Genus: Cochliobolus. Facultative parasite of barley (Hordeum vulgare) and other species of genera Hordeum, Triticum, Secale, Avenae, Panicum, Sorghum, Zea. Straw, seed, soil, winter barley, and wild grasses are sources of primary inoculum. Besides causing spot blotch this pathogen can attack roots, heads and grain. 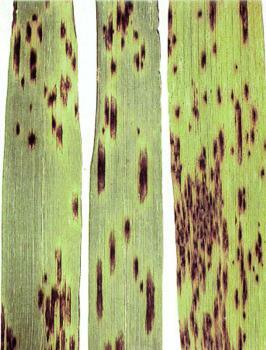 The symptoms of spot blotch vary with the host genotype and growth stage, as well as the environment. The first symptoms appear in the spring as rounded brown spots 2 x 5 mm with large yellow halos. Spots can develop on leaves and leaf sheaths at all stages of plant development. The lesions are typically round to oblong, up to 2-5 x 15-20 mm restricted in width by leaf veins, dark brown and chlorotic at their margins. In some cases, lesions may continue to enlarge and coalesce to form blotches that cover large areas of leaves. The kernel blight phase of this disease may develop if inoculum is available and the environmental conditions are conducive to infection. The mycelium of B. sorokiniana is deep olive brown. Conidiophores (50-150 x 6.0-8.5 .m) are single or clustered. Conidia (30-134 x 12-30 .m) are olive brown, ovate to oblong, and 3-10 septate and have rounded ends and a prominent basal scar. Conidia have bipolar germination. Fungus produces toxins (the main is helminthosporol), which are capable of causing disease symptoms. The sexual state is rare in nature. Pseudothecia can be produced in the laboratory by inoculating boiled barley kernels on mineral salt agar with a suspension of compatible mating types. Pseudothecia are black and globose, 300-400 .m in diameter, and have erect beaks, 50-200 .m long. Asci (20-35 x 120-250 .m) are hyaline, 4-10 septate, and spirally flexed within the ascus. Disease is widely distributed throughout the world. In NIS countries it is found where barley is cultivated. Extended periods (e.g., longer than 16 hr) of warm (above 20.C), moist weather are conducive to epiphytotic development. Incubation period depends on environmental conditions and takes 3-6 days. Early and heavy infections of the flag leaf result in the greatest losses in yield. B. sorokiniana is most important in Northern Caucasus, Central Chernozem Region, North-West and Central regions of Non-Chernozem region, Western and Eastern Siberia, Kazakhstan. Yield losses in Kazakhstan in epiphytotic period can reach 25-45%; in Russia to 41.4%. Hasanov B.A. 1992. Imperfect fungi as a causal agents of the main cereal diseases in Middle Asia and Kazakhstan. Abstract of PhD Thesis. Moscow. 44 p.
Kashemirova L.A. 1995. Phytosanitary diagnostic systems of spring barley protection against spot and net Helminthosporium blotches. Abstract of PhD Thesis. Bolshie Viazemi. 33 p.
Mathre D.E., ed. 1997. Compendium of barley diseases. St. Paul, Minnesota: APS PRESS. 90 p.